Ok, in the first example, the only way I could eliminate the trap there would be to introduce a fully protected left turn for traffic facing the SB light. This fully protected signal could run concurrently with the NB left turn signal (in essence creating a simultaneous lagging turn) or a lead-lag protected turn situation, here SB gets their left turn at the beginning of the sequence, and NB gets their left turn at the end. The first example is not really important for the issue at hand. 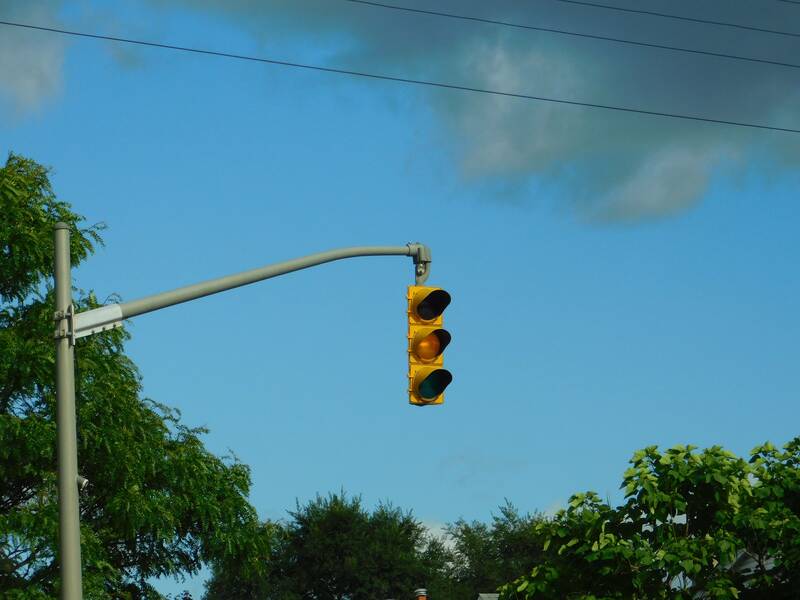 The yellow trap is a situation where suppose you are turning left, and you are in the intersection, you wait for a gap to make the turn, your light turns yellow, so you usually assume that oncoming traffic will come to a stop, but since oncoming traffic faces a green, they won't stop. When FYA is added, the traffic heading SB that wants to turn left, who are yellow trapped normally won't be because there is now a dedicated signal for a left PERMISSIVE turn. Indeed, SB in our intersection never gets a protected phase for left turns. When the solid yellow appears for SB (in this situation) this will mean that the oncoming traffic will face a yellow as well, and thus a driver won't be yellow trapped here. Inching out into the intersection, that behavior will not change whatsoever, you would treat a FYA just as you would treat a green in a permissive turn situation, you wait for a gap and then move it. Now the yellow trap has been eliminated 100%. That was an error I made before with cut and paste and not thinking, but this is the correct sequencing now. Awesome, yes that solves my confusion . I can see from your new table that this makes sense now. I should reread your FYA thread now that I understand this better. Thanks MisterSG1! I was in Meaford yesterday for Civic Holiday and I saw a 20/20/20 signal on Hwy 26 at Trowbridge St (the signal on the right in the GSV below). Also, on GSV, I see there's another one on the opposite side of the intersection! Backboards are recommended for all primary heads and are preferred on all heads except secondary heads used at very low posted speeds of 50 km/h or less. So I guess this is allowed, but I'm guessing that it's only temporary and that a backboard will be reinstalled soon. 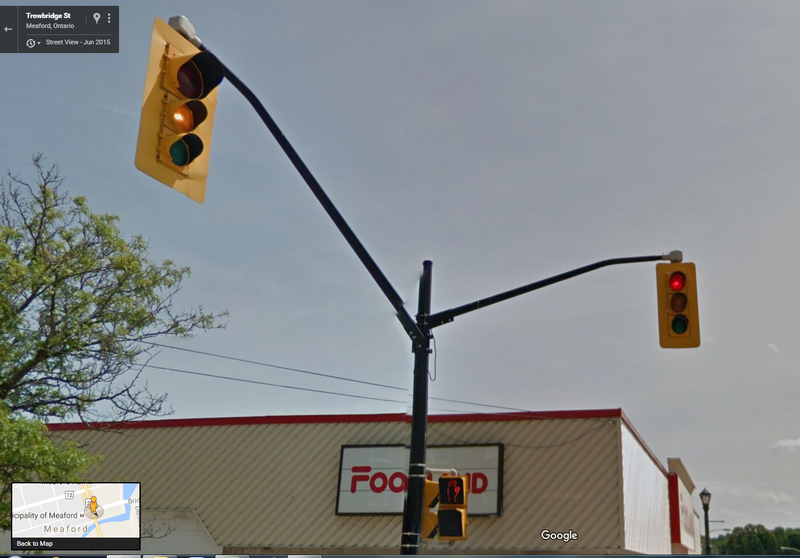 I found another 20/20/20 signal, this time in Pembroke, ON at McKay St and Nelson St. 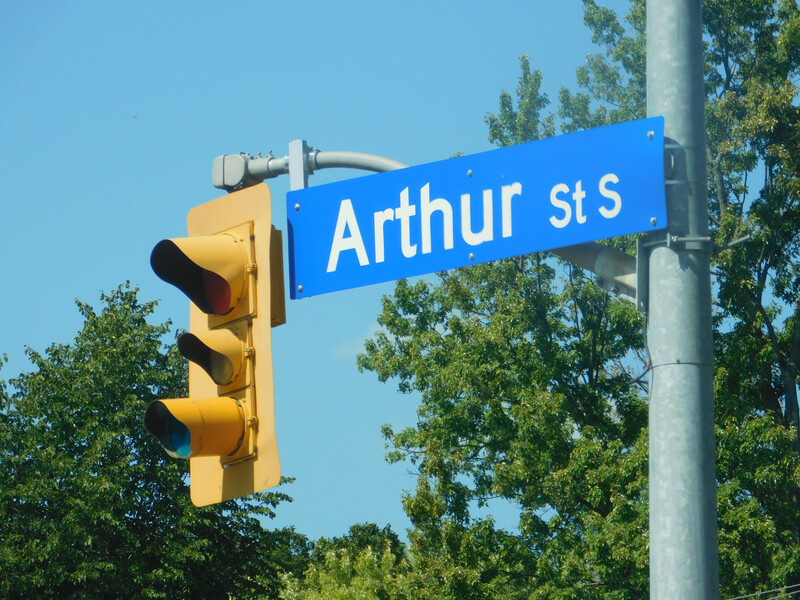 I saw a similar one at Wellington St and Metcalfe St, though I don't have a photo. To change the subject to something more interesting, I find it interesting how Ottawa uses straight green arrows when right turns are channelized. Just one of many examples is heading EB on McArthur St at Vanier Pkwy. But what I find particularly interesting is how the three signals heads are 30/20/30. The OTM Book 12 doesn't show this on the list of signals, but it seems very common place in Ottawa. Instead, the OTM shows Types 1, 2, and 3 with the yellow lights being 30 instead of 20cm. Now that's an oddity. Even here in the Northeast, it's becoming less and less common to see signals without backplates in rural/suburban areas. I didn't think Canada had any without backplates. I'm surprised I managed to find 2 in half-a-day in Ottawa. I'll be here for another 2 full days, so I'll have to be on the look out for more! 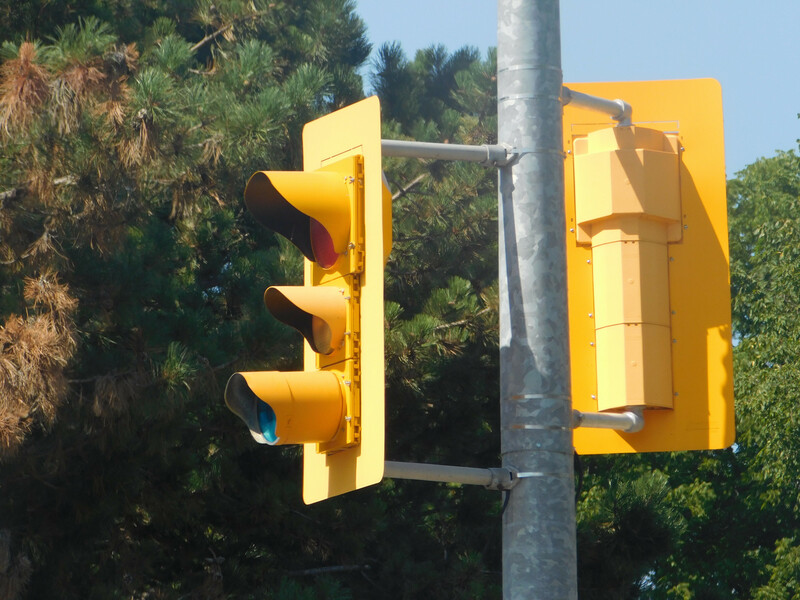 Look at Huron Church Road in Windsor... signals without back plates are not exactly a rarity. I guess your right. I haven't seen a single one in Waterloo Region*, but Ottawa had them all over the place (at first I was keeping track, but then it got to the point where I realized there's no point). 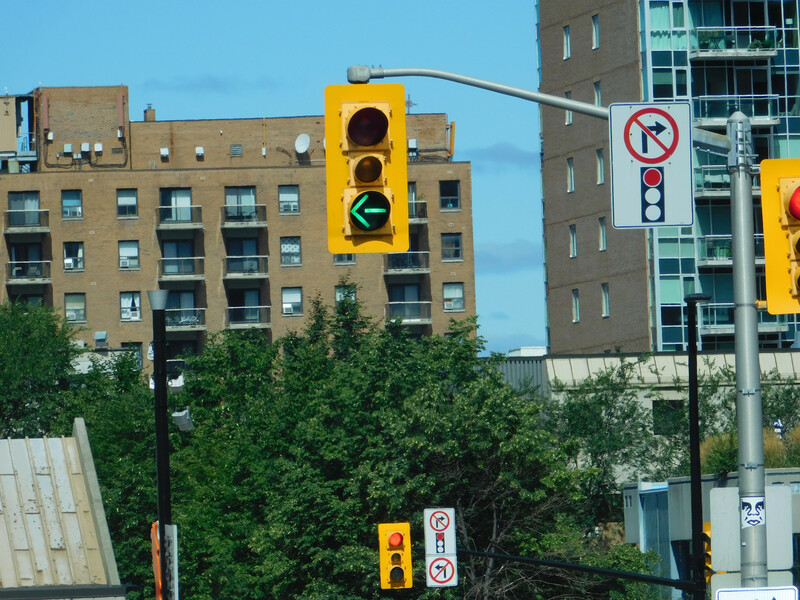 One thing I found interesting is that the 20/20/20 no backplate signals in Ottawa were always on the left side of the intersection, with "regular" signals in the middle and/or right. UPDATE Sept. 7th: I managed to find one today at King St and Fountain St in Cambridge (photo here). I also want to make it clear that they're used in many situations, not just channelized right turns. 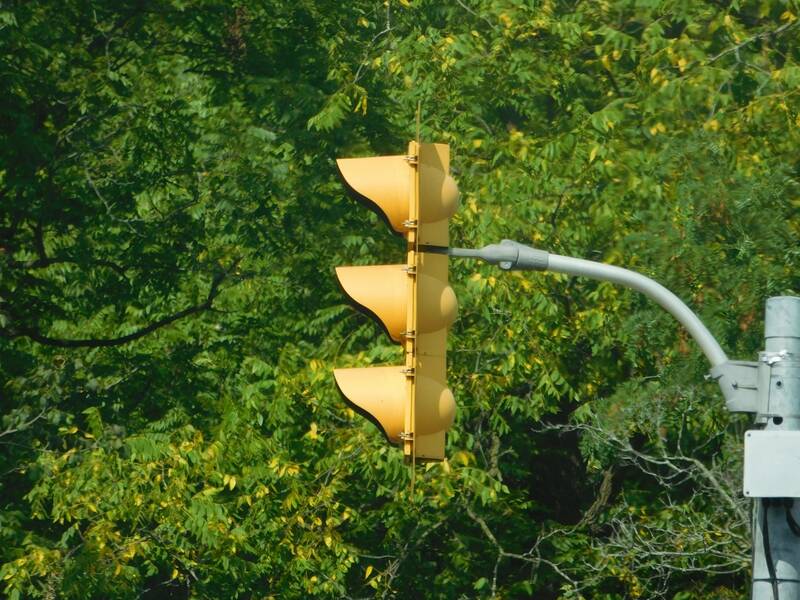 In fact, I get the impression that Ottawa tries to use these signals as much as possible. Does anyone have any ideas why this signal is like this? The green is likely a 3M PV converter. Although they never made 8" heads, they did sell 8" converters.